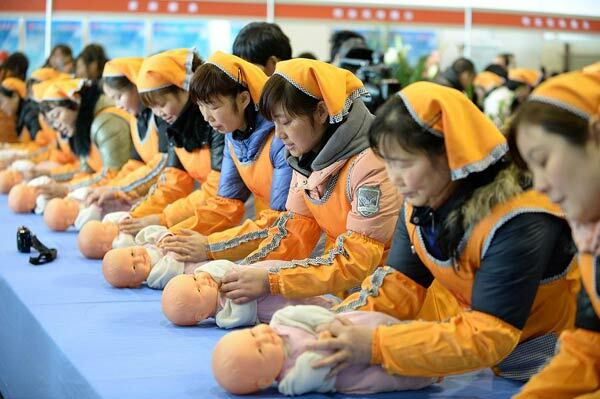 Chinese yue sao - nannies for baby and mother in the first months after birth - show their skills at a job fair in February. Many Chinese want to have a baby during this Year of the Horse, increasing demand for the nannies. The demand for Chinese yue sao -- nannies for baby and mother in the first months after birth -- is rising on the back of an expected baby boom in the Year of the Horse and relaxed family planning regulations. The salaries of some of these highly sought nannies -- who specialize in taking care of newborns and mothers for the first few months after childbirth -- are even surpassing those of white-collar workers, said childcare and homecare professionals. "You need to book the services of senior yue sao at least three months in advance. The demand has risen about 10 percent this year compared with those of last year," said Li Jielu, general manager of Beijing Ainong Homemaking Service Co, which provides cleaning services and baby care. To meet the diverse demands of customers, homemaking companies such as Ainong often classify the nannies into grades based on their skill level. The price of their services is set accordingly. "We don't recommend junior yue sao, who may lack the requisite experience, to look after newborns. 'Medium-skilled' yue sao charge from 9,800 ($1,575) to 12,800 yuan each month. Yue sao with premium skills, the so-called 'gold medal' nannies, can charge 16,800 to 19,800 yuan each month," Li said. The average salary in March for white-collar workers in Shanghai ranked first among Chinese cities, hitting more than 7,200 yuan a month, figures from major recruitment site Zhaopin.com showed. Average wages in Beijing and Shenzhen were nearly 7,000 yuan, the portal reported. Medium and premium level nannies are the most popular because of their specialized training and experience, Li said. There is no standard certification issued by the authorities for yue sao. But before they start work, these nannies need to present documents to clients including skills certification issued by homemaking companies, health certificates and identity cards, Li said.